Bioinformatics, also known as computational biology, is the use of techniques from applied mathematics, informatics, statistics, and computer science to solve biological problems. See also: What is Bioinformatics? 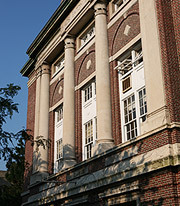 This is a highly interdisciplinary field, involving faculty in mathematical sciences, biology, computer science, chemistry, and several departments in the school of engineering. Rensselaer has established a joint bioinformatics center with the nearby Wadsworth Laboratories in the New York State Department of Public Health. Development and application of algorithms that aim to solve biological problems using DNA and amino acid sequence, structure, and related information. Search for patterns in biomolecular sequences that are functionally important, such as transcription biding sites. Prediction of structure or function from nucleic acids or protein sequence data. Development of methods and databases to classify large amounts of biological information. Development of algorithm and software that are important for current biotechnology applications.